Security officers stand guard to block journalists, whose names are not on the list of attendees allowed into a meeting led by Chongqing Municipality Communist Party Secretary Bo Xilai, during the National People's Congress (NPC) at the Great Hall of the People on March 9, 2012 in Beijing. On March 15, Xinhua news agency announced that Bo had been removed from office. This article was first published in the April 26, 2012 issue of The New York Review of Books. In China, the year is traditionally divided into periods based on the moon’s orbit around the earth and the sun’s path across the sky. This lunisolar calendar is laden with myths and celebrated by rituals that allowed Chinese to mark time and make sense of their world. So too the modern political calendar in China. It takes shape around the mysterious workings of the Communist Party, which rotates its top leaders every decade at a Party congress, a comet-like event that awes onlookers as a portent of change and renewal. The next congress is set to take place in the fall of 2012—the eighteenth occurrence in the Party’s ninety-one-year history—and is already being associated with unusual phenomena. The most spectacular was the eclipse of Bo Xilai in mid-March. The mercurial leader of the city-state of Chongqing—it is roughly the size of Austria, but has a population of 30 million, nearly four times as large—was forced to step down on March 15. Just a few months ago, commentators were saying that Bo was a serious candidate for the nine-member Standing Committee of the Communist Party’s Politburo, the apogee of power. Suddenly, he had vanished from the heavens. How did this happen and what does it mean? Thanks to his father, the younger Bo rose rapidly in the Party: he was mayor of a prosperous city, governor of a province, and then commerce secretary. But by the time of a Party reshuffle in 2007, the elder Bo had died and Bo Xilai was shunted off to Chongqing, a lateral move at best. His consolation prize was a seat on the Politburo, making him one of the Party’s top two dozen leaders. But he still lacked a place on the much more exclusive Standing Committee, an appointment some analysts thought might occur at the congress this fall. That all changed on March 15, when the government released a one-sentence report on its Xinhua news agency announcing that Chongqing had a new Party secretary, replacing Bo. The report did not say that he had been removed from the Politburo, although one presumes this will happen at the congress. Pekinologists noted that the report did not say that a new appointment awaited Bo—ling you ren yong, a stock phrase when a leader is to be moved to a new position. The assumption, therefore, is that Bo is finished. The immediate cause for Bo’s fall was the antics of his police chief, Wang Lijun. Wang, who had overseen a brutal crackdown on crime at Bo’s behest, had himself become the target of a corruption investigation. In addition, he may also have investigated the death of a British man, Neil Heywood, who may have had business ties with the Bo family. Feeling that he was under some sort of unbearable pressure from Bo, Wang seems to have fled to the US consulate in the city of Chengdu, about two hundred miles away. What he hoped to accomplish there is unclear. Some speculate that he wanted to turn over dirt on his boss to the US government, but how that would help him is a mystery. Others say that Wang requested asylum, but this would have been naive since the Americans have no way to ferry him out of the country, even if they had been inclined to give refuge to a man known for his “strike hard” police methods. Still others say that by fleeing to the US consulate Wang guaranteed he would be arrested by national state security instead of police working for Bo. Perhaps most plausible is that he simply fled in panic without a clear plan. In any case, a day after he entered the consulate he left and was taken into custody. Wang’s embarrassing behavior was likely the final blow for Bo. Senior public security officials are not supposed to flee to foreign diplomatic missions, especially not that of China’s chief rival. Since Bo had hand-picked Wang, the police chief’s implosion reflected badly on Bo. But this raises the question why the Party decided to investigate Wang in the first place. It’s a truism in China that almost any official or businessperson can be arrested for something because in a country without clear rules, breaking the law is almost inevitable. So why did they choose Wang? The most likely answer is that targeting him was a way of getting at Bo for refusing to accept his fate five years ago. After arriving in Chongqing, Bo tried to turn it into a base for his triumphant return to Beijing this year at the Party congress as a member of the Standing Committee. To do this, he launched a sweeping package of reforms—and, departing from usual practice for Party leaders, organized a large-scale media campaign to tout his program. Bo is tall, good-looking, and probably the only Chinese leader with a touch of charisma, and other leaders likely found this publicity highly annoying. Then Bo rammed through a series of social and economic reforms—a reform for several of the major issues facing the country as a whole. Declining morality? He pushed a public education campaign combining traditional virtues with a revival of old-style Communist public song performances. Rural–urban divide? He made it easier for farmers to move into cities in Chongqing (currently they are discouraged from doing so) and enroll their children in city schools. Foreign investment? He courted foreign companies in a way few of his predecessors did. Public order? He bolstered the police force and increased foot patrols. People often spoke of a “Chongqing model” of greater state control and leftist ideology. There was something to that, but Bo’s reforms actually included something for almost everyone. Some were progressive, such as helping farmers; some statist, such as huge public works programs; and others pro-business, such as courting investment. Civil libertarians were unhappy because he trampled on the law, with credible reports of torture of suspects and harassment of their lawyers; the past decade has seen a steady erosion of the rule of law and a rise of extrajudicial detention for government opponents or ethnic leaders. Amid this trend, Bo’s tactics might have been more draconian but were hardly revolutionary. More than anything, Bo was an opportunist who used these tactics to make his case for the Standing Committee. Indeed, it was the very fact that he was offering these measures as a kind of systemic reform that was a rebuke to the central leadership. It’s a little unfair to say that Premier Wen Jiabao and Party boss Hu Jintao allowed China to stagnate during their decade in power. Since the 1990s, China has become a major player on the world stage, boasts the world’s second-largest economy, successfully hosted the Olympics, and has shown more attention to the poor by implementing rural health care and providing a subsistence-level welfare program. But there’s a growing sense among many Chinese that their country’s government needs a new round of serious reforms similar to those that it made in the 1980s and 1990s. In China as elsewhere rising prosperity means rising expectations—especially for more transparency and openness, and less corruption. And all of this has been magnified through the country’s anarchic social media, like microblogging. Although under government control, these sites still pressure the government in ways that were rare in the past. Bo’s policies in Chongqing highlighted these problems too openly. Even in his last press conference, a few days before his dismissal, he pointed out that China’s Gini coefficient—a generally recognized way of measuring economic disparity—was terrible and getting worse. The idea of having to deal with such a domineering person must have been abhorrent to the incoming leadership team of Xi Jinping (himself the son of another famous general) and Li Keqiang (a close associate of Premier Wen who is considered a technocrat meant to run the economy). Like all new Chinese leaders, Xi and Li will be relatively weak and will only acquire power with time; Bo would have been by far the highest-profile and most media-savvy member of the nine-man team if he had been let in. Bo’s fate is now uncertain. When the scandal broke, observers still imagined that Bo might make a graceful exit, perhaps ending up as deputy head of a consultative conference or some other honorary position. Now, the only question is whether he or his wife will be charged with corruption. But with no reliable information, rumors dominate discourse in Beijing. Bo, it is said, has been arrested. He is being interrogated. 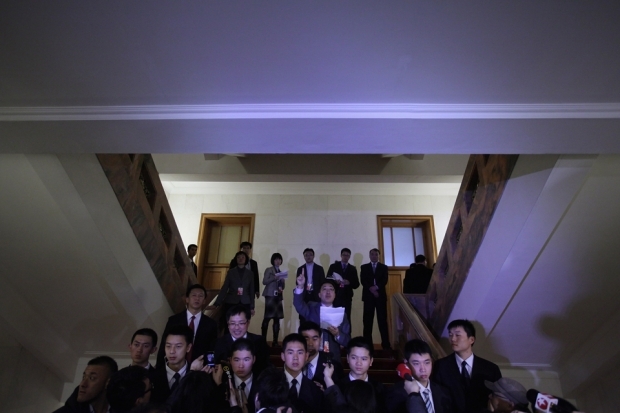 Shots were fired at the Diaoyutai guest house. Soldiers are on the streets. The only reason any of this can be taken seriously is that the government does; discussion of Bo’s case is strictly forbidden on microblogging sites, with search terms like “coup” and “shots” blocked. Before canning Bo, Wen justified his actions in noble terms, saying that China needed political reform, without which “such historical tragedies as the Cultural Revolution may happen again in China.” Bo, by implication, had failed to learn from history and was resorting to Maoist-style publicity campaigns to whip up support. A less charitable explanation is that Wen was simply being defensive about his own failure to deliver on reforms. His call for political reform is by now an annual occurrence, but he either has no power to implement it or his definition of political reform is something akin to making the current system more efficient and responsive to citizen complaints. By equating muscular reforms with Cultural Revolution–style anarchy, Wen could have been justifying his cautious approach. In this, the political and traditional calendars are in alignment. The political calendar started on March 5, when the National People’s Congress’s annual session opened with Wen reading his yearly work report, the opening pendant to his excoriation of Bo last week. March 5 was also the lunisolar calendar’s festival of jingzhe: the “Awakening of the Insects”—the time when hibernating animals awake. Given what has happened, it seemed oddly appropriate: the start of a new season and the rousing of dormant forces.